On the set of a Backdraft sequel? Not quite. 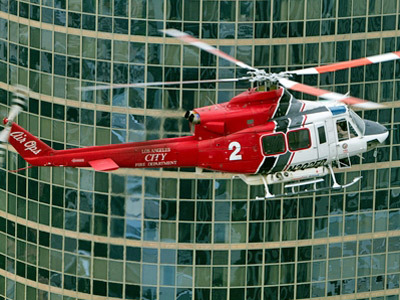 It's the pre-disaster planning drill and LAFD training exercise that took place recently at Century Plaza Towers' north tower, 2029 Century Park East in Century City. The drill simulated conditions resulting from a large magnitude earthquake and used a master disaster preparedness plan developed for the office complex by Massey Disaster Planning. 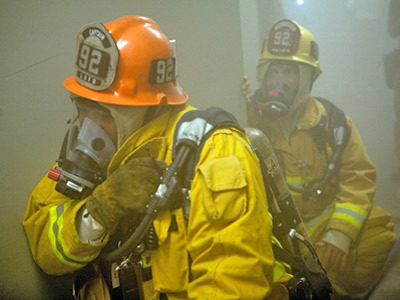 According to property manager CB Richard Ellis, this was the largest high-rise disaster training exercise in the US in many years, involving 60 LAFD personnel — including six command chief officers, an array of fire-fighting equipment, and an LAFD helicopter, along with personnel from the building and Massey. Move over, Fox Plaza — if you think the Century City office tower got trashed in Die Hard, check out what they did at Century Plaza Towers. The simulated conditions included a major fire erupting on one of the building's upper floors, heavy smoke, missing and trapped victims, compromise of the build's façade, a fire riser water main break, and a gas leak. The exercise included a test of the "Rapid Ascent Team" training for high-rises and involved participants in stairwells, the building's exterior plaza, and on the fire floor as well as the floor above it. Emergency response personnel used the Massey Disaster Pre-Plan throughout the drill to aid in tactical decisions. Now if you'll excuse us, we filmed the whole drill and now have a meeting with our agent.